There’s more to Hogan’s Alley than it originally seems. If you’re doing a double-take and noticing considerable similarities (especially on the main screen) to Duck Hunt, that’s not a mistake. Considering it was developed by the same studio, in the same year, and a launch title for the initial NES, this was the next logical step for a light gun shooter. I was probably one of the few that picked this title up at its initial release but it impressed the hell out of me. It was a surprising simulation of the FBI training program with cardboard cutouts for new recruits. Basically, if you’ve ever seen a shooting range in a movie, this is the basic design for the program. 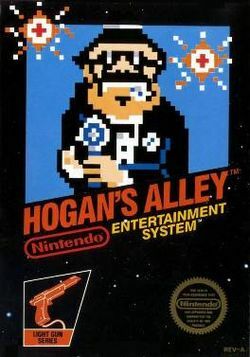 When Duck Hunt and Wild Gunman were the only competition, Hogan’s Alley (especially in the cityscape “Game B”) was a breath of fresh air and gave way to the more popular Lethal Enforcers and Crime Patrol series. 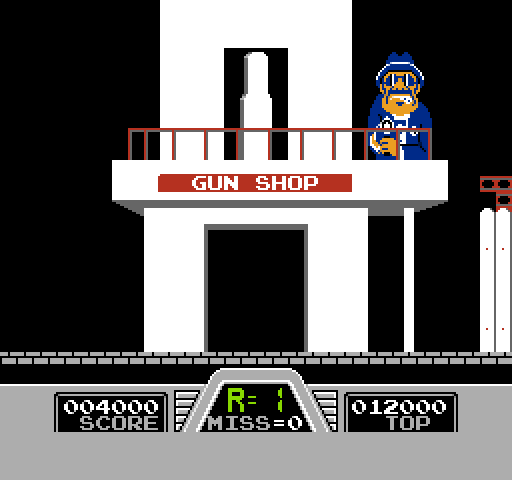 You have 3 games to choose from: one is a cardboard shooting range, one is a simulated town (complete with amazing music) where you take out the bad guys and spare the innocent, and finally a can shooting game that provides the most compelling gameplay of the mix. The game was apparently named for the FBI training program, which I was unable to validate, but I can confirm it was part of a Special Police training school at Camp Perry pre-World War II and an actual training camp name at the Quantico FBI training camp. While there’s not much else to say about the title, it’s just a fun time that demonstrates what we all love about light gun shooters.